An individual is described as "clairvoyant" when he or she demonstrates keen perception or heightened senses. They are able to detect things that are not easily detected by the senses, and are even said - although it is often debated - to be able to see the future. Some famous people are thought to have been clairvoyant. 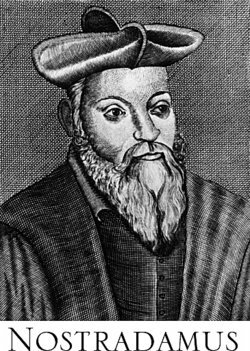 Nostradamus predicted other catastrophes that were seen as predicting events into the 19th, 20th, and 21st centuries such as floods, earthquakes, massive fires, murders, worldwide plague and pestilence outbreaks. As a Christian, Nostradamus was also very interested in the rise of the Antichrist and the takeover of Europe by hostile Muslim groups. Abraham Lincoln, some have said, was a clairvoyant who accurately predicted his own death. Whether this is true or just a coincidence is debated; however, the facts seem to tell a very interesting story. He was woken up by the sound of crying and went into the East Room of the White House, where a casket was laid open. There was a throng of mourners as well as several men guarding the casket. When he asked who was in the casket, one of the soldiers told him that it was the President, who had been killed by an assassin. Three days after telling his wife this dream, Lincoln was shot and killed by John Wilkes Booth. Some people call it time-travel, some people call it an instance of clairvoyance, and some people call it made up - but the Moberly-Jourdain incident on August 10, 1901 captured the imaginations of many. Anne Moberly and Eleanor Jourdain, two academics, were visiting the Palace of Versailles where they became lost, and claimed that a great dreariness came over them. They encountered various figures from nearly one hundred years before, including Comte de Vaudreuil and Marie Antoinette, before finding their way out. Later, they learned that on August 10, 1792, the Tuileries palace in Paris was besieged, with the monarchy being destroyed a month and a half later. Some believe that the women had an instance of clairvoyance and had a look back in time. This alleged psychic claimed to be a "prophet," with the ability to answer questions during a sleep state. It began with him answering questions about the health and well-being of his subjects, but later moved to "visions" of the subjects' supposed past lives, theories about the universe, and predictions about the end of the world. Cayce would answer questions about nearly anything the subjects asked, and then would wake from his trancelike state, claiming not to remember what he said while in the trance. Although he has many skeptics, famous individuals from President Woodrow Wilson to composer Irving Berlin were among his many subjects. When you predict who a friend is going to marry. When you have a dream about the numbers that are going to come out in the lottery. When you predict the exact outcome of a sporting event that happens a week later. When you have a vision of what house you are going to buy and find a home that looks exactly like it. When you visualize an entire future conversation in your head and then hear that very same conversation shortly after. When you get a funny feeling that a friend you haven't seen in a long time is going to show up and she appears the next day. When you feel an odd tingling in your leg at the same time as your sister breaks her leg half a world away. All of these situations would be examples where you might be described as being clairvoyant since you are unusually perceptive or able to tell the outcome of something before it occurs. "Examples of Clairvoyance." YourDictionary, n.d. Web. 19 April 2019. <https://examples.yourdictionary.com/examples-of-clairvoyance.html>. An individual is described as "clairvoyant" when he or she demonstrates keen perception or heightened senses. They are able to detect things that are not easily detected by the senses, and are even said – although it is often debated – to be able to see the future. Examples of Onomatopoeia PoemsExamples of Poetry GenresExamples of Nonrenewable ResourcesExamples of Hyperbole in PoemsExamples of IllusionExamples of OmnivoresExamples of Cognitive PsychologyWhat Is Gaslighting?